This post will be ragged and raw. Late Labor Day afternoon, 2 days ago, a precious family holiday dinner filled with laughter, great food and family, ended in tragedy. An after dinner round of go-cart rides turned to terror and heartbreak as some of our family members began to take turns touring our golf cart friendly neighborhood. As the cart rounded a neighborhood corner a new family friend from church, a dinner guest, fell from the front seat onto the hard surface of the street and crushed her head. Ambulance sirens and cries of terror filled the space that had just moments before been filled with story telling and laughter. The hours that followed, although not completely unfamiliar, were ones that create an “out of body” sensation and short time spans between “how in the world did this happen?” and overwhelming tears. Although there is no way for me to capture all that has transpired but because I write, I am compelled to start unwrapping in writing 2 key themes have risen to the top over the past 40 or so hours at a level I have never seen over the past 31 years of my faith walk. Our new friends arrival through the emergency room doors led to close to 5 hours of brain surgery. “FAMILY” both blood and spirit, immediately began to fill the waiting room. The phone lines and that invisible prayer line that connects us one to another across miles shook every phone and every human in the room. It was eternity–it was mili-seconds–when a weary surgeon stepped into the ICU waiting room. It was 2:30 am when he whispered the dreaded words “there was nothing we could do to save her”. It will be your decision when to turn off the machines that are breathing on her behalf. Bodies crumbled to the floor and cries and prayers filled the room. A few hours later my family walked numbly to our cars still wondering how we ended up here and what in the world life would look like from this day on. A human life, a stranger, a friend was taken from us within a matter of hours. We fell into our beds but sleep did not come. Jesus told us to “heal the sick and raise the dead” as His disciples. “What does that look like Lord? What should we have done? What would you have us do?” I fell asleep asking God to resurrect her. To go beyond our prayers or our actions and raise that girl from the dead. We have all been in these situations. We have all been faced with seasons, moments of intense prayer. Believing God for the outcome we long for. Healing. Restoration. Recovery. I recalled the many times that my husband and I have stood over physical life and death together. I remembered a son with a broken neck–we prayed, his body was healed. I remembered my Dad’s sudden heart attack. We prayed, his body was not healed on this earth. I remembered a tiny baby girl, 10 inches long and less than 1 pound. We prayed, her body was healed. I remembered a beloved newborn grandchild. We prayed, his little body was not healed on this earth. On Monday night, we read God’s word about healing. We prayed, we believed, we released. Yesterday morning, we woke up to a phone call. She did not die in the early hours of the morning. In fact, she has begun a slow and steady journey towards healing. #2– The Power of Family. Family of flesh. Family of Spirit. My husband and I have been part of our church family for over 20 years. We were part of our original church. We now have 4 campuses and somewhere around 15,000 members. One might think they could get lost in a church that large. One might easily feel they didn’t matter and were unseen. As we followed the ambulance to the hospital that night, our church family began to gather. They started to form teams of prayer. They began showing up until that little ICU waiting room and the surrounding hallway filled with our church FAMILY. 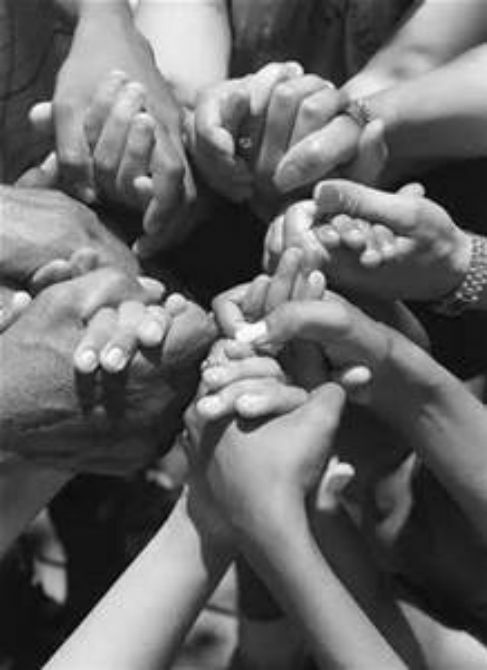 We all held hands and prayed. Others walked the hallways and prayed. Some sat in corners or huddled in small groups. As my flesh family listened we learned more about our new friend who was our dinner guest and the one who was lying on a bed with machines keeping her alive is a very quiet member of our church family. Things she would never tell us about herself. She has no platform and she has no plaques with her name on them. As the room filled her story began to unfold. She is very much loved and very much known throughout our church. She is a servant. She is a minister. She is called. She is anointed. She is seen! She is appointed and God is not done with her yet!! I have been overwhelmed with emotions. With thanksgiving. With a knowledge of being loved and loving back. I knew that having a church FAMILY is important but I have risen to a whole new level of understanding what God has in mind for HIS FAMILY. Sing praise to His name. A Father too the Fatherless, a defender of widows, is God in His Holy dwelling. but the rebellious live in a sun scorched land. My question is this my reading friend–DO YOU have a church FAMILY? Not a perfect church family but a family just the same, where you serve, share, pray, love and get loved on? Because life is ragged and raw, you will need them someday and God wants you to BE SET in one! In His grip and still praying, please pray with us. Her name is Tina. Please join me today around 12:30 EST on Periscope, a bit later than my attempted 10am on Monday, Weds and Friday. Lets talk about a bit about Prayer and Family. Previous Post: « Giveaway From far Away! How tragic! I will be praying for Tina. May the Lord be glorified through her life! Thank you sweet friend! Grateful for your prayers!! Jesus, do your thing. As only you can do. We love you. Thank you Michele. You know this walk well–right?!!! Love you friend!! You get this for sure. Prayers for Tina!! I’ve walked this path similar to this one. My husband is currently in jail and his grandparents (where he has lived for the past year separately from me due to him not being allowed any contact with our children) church family has loved on me and the kids like they were on their own. My family is also struggling financially and this weekend we were there and after church one of the church members stopped by and gave me and the kids some money to relieve the stress of my parents who help financially support us. These people who I don’t really know also showed up at his court hearing and showed their support when it was a hour and a half away. Seeing the support of a church family has made me and the kids join a church. The only problem I have with our current church is that they really don’t know the situation that we are going through mainly because due to legal reasons I can’t discuss it and to me I don’t want to feel like a charity case. God is working through me. I used to think we didn’t to go to a church to serve God which we don’t but it is GREAT to be a part of a loving family. WOW! I love this story and will be praying that God gives you a safe place in your church family to share and be loved on. Sometimes is os tougher to RECEIVE help than to offer it, right?!! Thank you for sharing Miranda. Yes it is difficult to receive help! Thanks for the update on Tina!! Praying for all of you!! Thanking God that He has begun healing her body! I know too well what the family is going through but I also know as you so beautifully stated that God will give them the grace they need at this time and the church FAMILY to come around them for support! That is what is so beautiful about the body of Christ. Love and prayers to all!! Thanks for your update this morning on periscope. Will continue to pray for her. I will be joining my prayers with yours. Family is more than just blood. Shared experiences form I breakable bonds, too. A wonderful testimony of the family of God coming together in prayer. God is always at work where 2 or 3 are gathered together in his name. Thank-you for sharing.